I’ve recently found some new things that I’m pretty into. For instance, I never thought I’d like yoga, but then I saw how much better life can be if I joined a cult and then I stopped blogging for 5 months and no one seemed to worry about me at all. I may have written off Downton Abbey in my younger days, but recently I found myself waiting with Bated breath to find out if Mr. Bates would kill Anna. (I really didn’t mean for that to be a Bates pun). In other words, I’m trying to get more into getting into new things and I’m open to suggestions. Here are some things that may help you recommend your favorite things to me. One of my worst qualities is that I’m just not that into music. I can’t listen to music while I do other things. I don’t turn on music when I get home. I am tone deaf. Others cringe when I sing along. I’m not that into hip hop. I’m pretty out of touch with modern music trends. I like Mumford & Sons. So if you have suggestions for things that might break me from this trend, call me maybe? I still haven’t watched Breaking Bad. I watch Louie. I watched 4/9s of the Girls season and liked all the ones I watched but didn’t commit. I have the attention span of a 17 month old with ADHD, yet I don’t really like clip shows. I have netflix streaming but don’t use it enough. I’d like to binge watch a couple of shows that will make me happy. Preferably comedy. I just saw 21 Jump Street. Surprisingly good. I have the least discerning palate of any movie goer ever. I literally can’t remember a movie I didn’t at least think was ok.
Should I be more pinteresting? I’ve been trying to do a handstand against the door of my apartment, but Anne thinks it’s too dangerous. I also worry that one time I will be upside down and she’ll come through the door and break my neck and then feel really bad that I end up in a wheelchair and she has to take care of me for the rest of her life and feed me through a straw. So that’s pretty much the danger threshold. 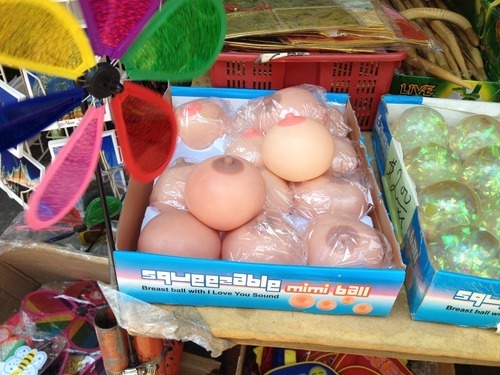 So if your suggestion was going to be squeezable breast balls, then you can hold your advice until later. This entry was posted in Fitness, Uncategorized, Yoga and tagged breast balls, Downton Abbey, fitness, Health, music, Running, yoga by Rob Pollak. Bookmark the permalink.